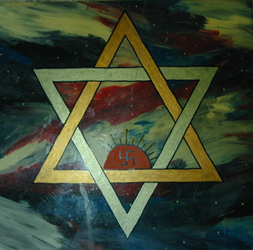 The image below will be familar to some of you as the basic form of the Merkaba. When Grandfather Martin showed me this painting he referred to it as "The Two Brothers," and added, "They always come together like this." The individual Merkaba Chariot is a vehicle of immense power that, when consciously activated through a long psychological and emotional process of spiritual self-transformation, can transport us safely back to our original Place of Emergence at Galactic Center -- Source. As you saw on the map of the Inner Earth on the previous page, Central Sun is not to be reached by traveling outwards into Outer Space but by journeying inwards. Grandfather Martin suggested that during the Purification, those who are to be surviving may be transported to Shamballah in the Inner World by UFO-like vehicles such as these. Continue on to "Migrations - Part 2"